On the town plan you will immediately spot the difference between the irregular pattern of roads from the time of the Rohans and the imperial rigour of Napoleonic urbanism with its straight lines. Small booklets are available at the Tourist Office to guide you on your stroll around these two parts of the town. Guided tours are available during high season. Influential beyond Brittany, the scope of the Rohan family is exceptional. 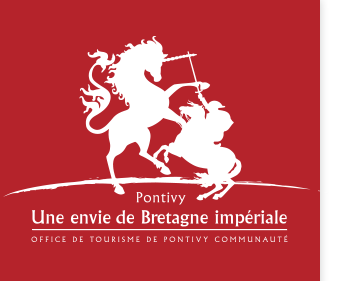 Pontivy had the privilege of being the chief place of their viscount from the fourteenth century and their duchy created in the seventeenth century. From the fortress of Viscount Jean II, to the basilica of Notre Dame de Joie, to the charming rue du Fil and rue du Pont, the stones are still testimony to your discovery half timbered houses and of small Renaissance mansions. You will relive the evolution of the city from the time of the presence of the very powerful lords of Rohan; from the medieval times until the French Revolution. The reconstruction operation of the Castle of the Rohans . Following the collapse of part of the castle, the city appealed to the generosity of the inhabitants and lovers of Pontivy to finance the work of our beautiful castle. A man like Napoleon the First and the perseverance of his nephew, Napoleon the Third., was needed to create a city within a century. There are few places where the Napoleonic ambitions are so clear and legible. Through the checkered streets you will discover the imposing square of arms, around which rise, majestically, the barracks, the palace of Justice and the town hall-sous-prefecture. A few steps from there the hundred-year old trees of the square Lenglier will unveil the delicate church Saint Joseph. From great military projects to the very skilful structuring of the empire, decipher the great projects of Napoleon for Pontivy, and find the different facets of his fascinating personality.